Ronnie O'Sullivan sizes up his next shot. MARK WILLIAMS DOES not like The Crucible and Sheffield too much but he may be packing his bags soon after a stunning run from Ronnie O’Sullivan on Sunday. The three-time champion, resuming 5-3 up, won six frames in a row after recording breaks of 107, 74, 51, 68, 128 and 93. 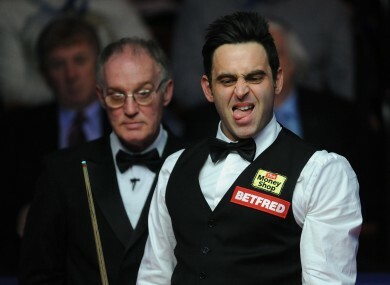 O’Sullivan leads the tie 11-5 and needs just two more frames to progress to a quarter-final against Neil Robertson. Williams, a two-time world championship winner, only showed glimpses of his best as he complied a break of 83 but will need to put together a remarkable run when play resumes on Monday at 7pm. The Australian Robertson, winner here in 2010, moved into the last eight after recording a 13-9 win over David Gilbert. Others that have booked passage into the quarters include Stephen Hendry, Ryan Day and Stephen Maguire. Judd Trump is also looking favourite to move forward as he leads Ali Carter 9-7. Matthew Stevens trails Barry Hawkins 5-3 while James Jones and Andrew Higginson are level at 4-4. Email “Back to his best: O'Sullivan puts together stunning run to near quarter-final”. Feedback on “Back to his best: O'Sullivan puts together stunning run to near quarter-final”.